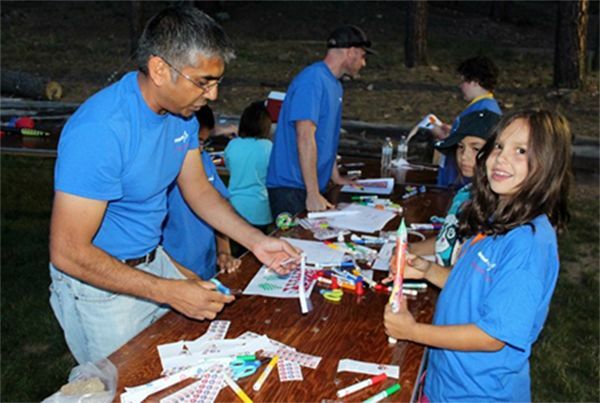 In early August, a group of 25 Orbital ATK volunteers from our Chandler, Arizona site drove to Camp Rainbow, located in Prescott, Arizona, to host a fun-filled evening of rockets and science. The Phoenix Children’s Hospital’s Camp Rainbow is for children who have, or have had cancer or a chronic blood disorder. For one week every year, campers have the opportunity to enjoy fun and meaningful experiences, with others in a supportive environment full of activities. Camp Rainbow offers these kids and their families the opportunity to establish friendships and have fun. The night started out with a Skype call from former five-time astronaut and Orbital ATK Vice President, Kent Rominger that included a questions and answers session with the children. While most of the questions were about what it is like to live in space, a few of the older children asked more technical questions. Following the astronaut session, Orbital ATK employees joined the children in a large meadow where teams built, decorated and launched paper rockets, learned a little chemistry as they launched Alka-Seltzer rockets, and received “launch team” t-shirts. One of the biggest highlights of the night - surpassing even a call from an astronaut and launching rockets - were the smiles from all those involved. 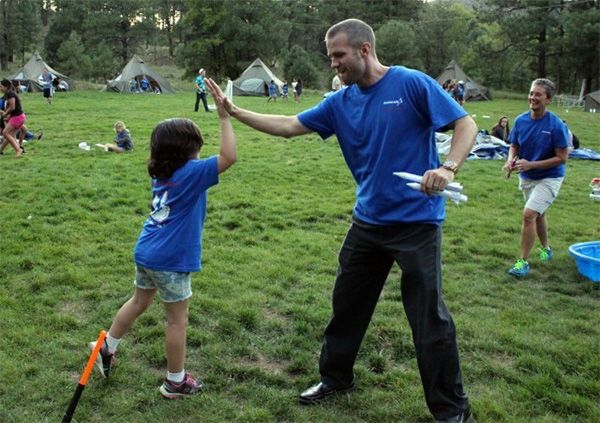 Orbital ATK employee high-fives a young lady who just completed a successful launch of her paper rocket. Orbital ATK volunteers help the children attending the Phoenix Children’s Hospital summer camp make, build and launch paper rockets. 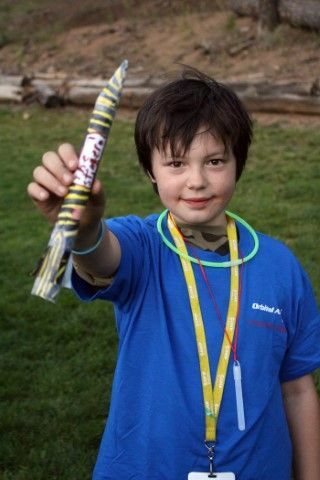 This young man shows off his paper rocket, “The Stinger,” before it made its launch debut.